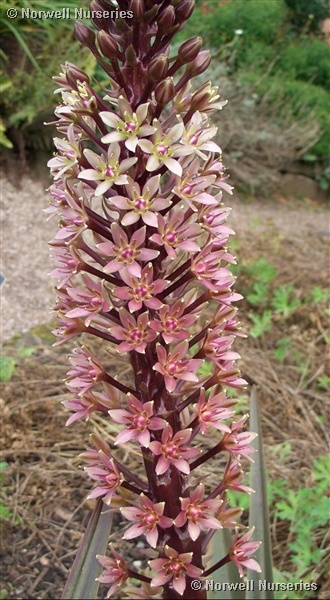 Eucomis 'Sparkling Burgundy' A dramatic HARDY bulb with dark purple strap-like leaves (darkest in full sun) and dramatic tall pineapple-like pink flowers on a dark purple stem. For sun, well drained position or excellent in a pot (but do not allow to become frozen through) Reliable and eye catching. These are about one year from flowering size but worth growing for foliage alone. Came thru winter of 2009 unscathed.